Hello everyone! I’m Marjolein and I am the new digital archivist trainee at the Weston Library. The Weston Library, or originally the New Bodleian Library, was built in the 1930’s in order to house all the books and collections that no longer fit in the Old Bodleian. However, by 2010 the Bodleian’s holding’s had outgrown this building as well. The decision was made to move the majority of the material to Swindon and to completely renovate the New Bodleian. The library reopened under the name Weston Library in 2015, and is now home to the special collections. It has two large reading rooms where readers can consult the material in these collections. So now you know where I work, but I bet you are wondering what it is I actually do. Well, I have a job that offers quite a bit of variety, which makes it exciting. On Monday mornings you can find me in one of the two reading rooms of the Weston Library to answer questions that readers have, give out archival materials and books etc. I am also being taught how to catalogue both digital, paper and hybrid collections. This involves making a boxlist (where you list what is in each box of a collection brought into the archive), creating a cataloguing proposal, arranging the material in a way that is logical for readers who wish to consult it in the future, cataloguing it and publishing it online. So far I have really enjoyed making boxlists, as you never quite know what material you come across… The most exotic items I have encountered are undoubtedly temporary tattoos and multi-coloured, gold inscribed corkscrews. That’s right, archiving doesn’t just involve books and piles of loose paper. 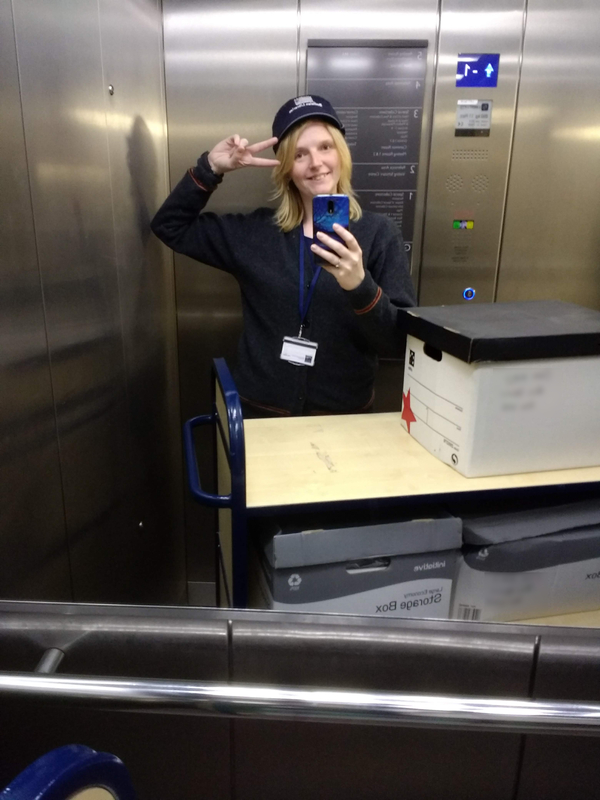 Me getting materials out of the stacks whilst wearing the protective and “ever so stylish” Bodleian bobcap. Speaking of publishing catalogues online, I am currently helping my colleagues to reformat the XML (i.e. code) behind the online catalogues of the special collections. We are doing this to transfer them to a new, better system, which will help readers navigate the online collections more easily. Next to this, I also spend quite a bit of time digitizing media such as CD’s, cassette tapes etc. using forensic software so that the information is preserved for posterity. Apart from all of the above, I also work on the Bodleian web archive, where we archive entire websites so anyone can still consult them after their owners have taken them offline. We are currently writing a Libguide to accompany our collection, to help readers navigate the collection and to refer them to other web archives that might be of interest to them. I am really enjoying my time here and definitely am not getting bored with all the exciting and interesting tasks I have to do. I cannot wait to see what else there is to learn! What sort of forensic software gets used? And how does it work for cassettes- is it something that physically reads the tape ribbon? This is a field of information studies that is fascinating- the preservation of information that is on formats that are no longer readable. I think the WayBack Machine is doing its best with the internet, but there will probably come a time when the internet is considered ancient tech like cassettes, minidisk or betamax!